Wanneer patienten met baarmoederkanker naast hun behandeling met bestraling en chemo (cisplatin) samen aanvullend hyperthermie krijgen dan verbetert dat sterk de resultaten van de behandeling. de ziektevrije tijd gaat van 60,6% naar 70,8%. De kans op geen recidief gaat van 71.0% naar 80,1%. De overall overleving gaat op 5 jaars meting van 64,8% naar 77,8%. En dat allemaal zonder stijging van de bijwerkingen. De studie is uitgevoerd in verschillende ziekenhuizen in Japan gedurende een periode van 15 jaar. Hier een aantal grafieken uit het volledige studierapport: http://www.tandfonline.com/doi/full/10.1080/02656736.2016.1213430 dat gratis is in te zien met mooie referentielijst welke onderaan dit artikel aan het abstract is toegevoegd. Kunt u wellicht eens meenemen naar uw behandelend arts mocht dit van toepassing zijn op u.
Int J Hyperthermia. 2016 Nov;32(7):801-8. doi: 10.1080/02656736.2016.1213430. Epub 2016 Aug 12. 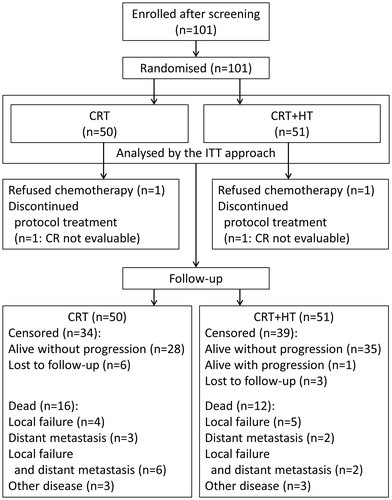 A multicentre randomised clinical trial of chemoradiotherapy plus hyperthermia versus chemoradiotherapy alone in patients with locally advanced cervical cancer. Harima Y1, Ohguri T2, Imada H3, Sakurai H4, Ohno T5, Hiraki Y6, Tuji K7, Tanaka M8, Terashima H9. To evaluate the effectiveness of whole-pelvic hyperthermia (HT) added to standard chemoradiotherapy (CRT) in locally advanced cervical cancer (CC), by investigating the clinical response and survival of patients treated with cisplatin-based CRT vs. CRT with HT (CRT + HT). This study was conducted at five hospitals in Japan between September 2001 and March 2015 in patients with the International Federation of Gynecology and Obstetrics stage IB (bulky)-IVA CC undergoing definitive CRT. After giving a written informed consent, patients were randomly allocated to two treatment groups: CRT and CRT + HT group. Overall survival (OS), disease-free survival (DFS), local relapse-free survival (LRFS), complete response (CR) rate and tolerability were evaluated. In total, 101 patients were treated. Patient characteristics, total dose of cisplatin and radiotherapy were similar for both groups. Although not statistically significant, the 5-year OS, DFS and LRFS in the CRT + HT group (77.8%, 70.8% and 80.1%, respectively) were better than those in the CRT group (64.8%, 60.6% and 71.0%, respectively). 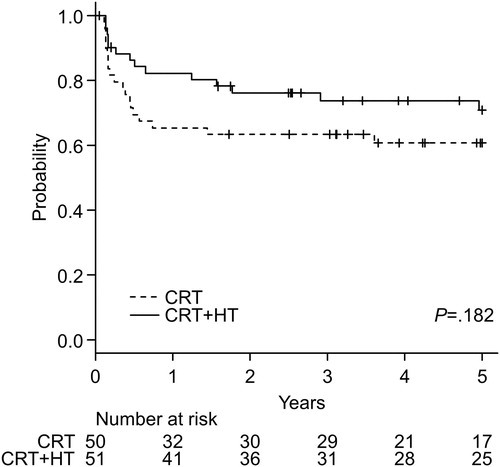 CR was significantly more likely to be achieved in patients in the CRT + HT group than in the CRT group (88% vs. 77.6%; adjusted odds ratio, 3.993; 95% confidence interval, 1.018-15.67; p = .047). CRT + HT was well tolerated and caused no additional acute or long-term toxicity compared with CRT alone. 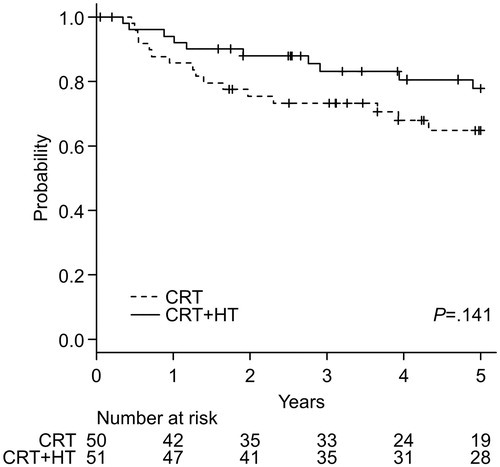 HT combined with CRT improved the CR rate of CRT in patients with locally advanced CC, however, could not improve survival outcomes. Further studies in larger samples are warranted. Bethesda MD. (1985). Dose and volume specification for reorting intracavitary therapy in gynecology. International Commission of Radiation Units and Measurements. Mantel N. (1966). Evaluation of survival data and two new rank order statistics arising in its consideration. Cancer Chemother Rep 50:163–70. Cox DR. (1992). Regression models and life-tables. Breakthroughs in statistics. New York: Springer; p. 527–41. Cox D. (1958). The regression analysis of binary sequences (with discussion). J R Stat Soc B 20:215–42. Feldmann HJ, Seegenschmiedt MH, Molls M. (1995). Hyperthermia – its actual role in radiation oncology. Part III: clinical rationale and results in deep seated tumors. Strahlenther Onkol 171:251–64. Reageer op "Hyperthermie naast bestraling en chemotherapie verbetert op 5 jaars meting sterk ziektevrije overleving 10,2%, kans op een recidief 9% en overall overleving +13% bij baarmoederkanker"